What HR Professionals Need to Know about the EEOC’s Guidelines on Criminal Backgrounds What is Lean Manufacturing? We spoke with Tom Ault, a Senior Training Consultant at ERC, about what a team is, the characteristics of an effective team, and the four stages of team growth. Many times these teams are put in place without a clear set of guidelines of how they will work together, how decisions will be made, or even what it takes to be effective. This is where a strong leader can make a difference in helping their teams be effective. Ault says one of the most important characteristics of effective teams is having open communication. Being able to express one’s ideas or concerns openly is a great way for your team to look at you as the true leader and also feel a level of trust within the organization. Effective teams also have clear objectives that are accepted by everyone, a good formal and informal organization structure, and clear roles and expectations of team members. All teams are comprised of individuals with their own needs and personalities. It is inevitable that teams will experience conflict. Good leaders recognize this and provide tools that will help manage those differences. The bottom line is teams will only be as effective as their leaders. Good leaders have good teams, poor leaders have less effective teams. As a leader, you can use the following stages as a guide to help your team develop through its natural progression. One of the conditions necessary for successful teamwork is a team members' ability to make decisions and solve problems as a group. It is important to know when a decision requires team input or if it can be made individually. One way to make decisions that is often misunderstood is consensus. Consensus means coming to an agreement. Creating consensus in a team setting means finding a proposal acceptable enough that all team members can support it, with no member opposing it. Reaching an agreement that everyone "can live with"
Consensus is not a unanimous vote; majority or minority rule; one-person rule; or bargaining. Creating effective teams is a process and doesn’t happen overnight. Teams naturally go through phases as they grow. A leader has to learn how to lead and manage the team, and help the team to overcome team challenges. Using some of these principles, you’ll be able to build effective teams within your organization. 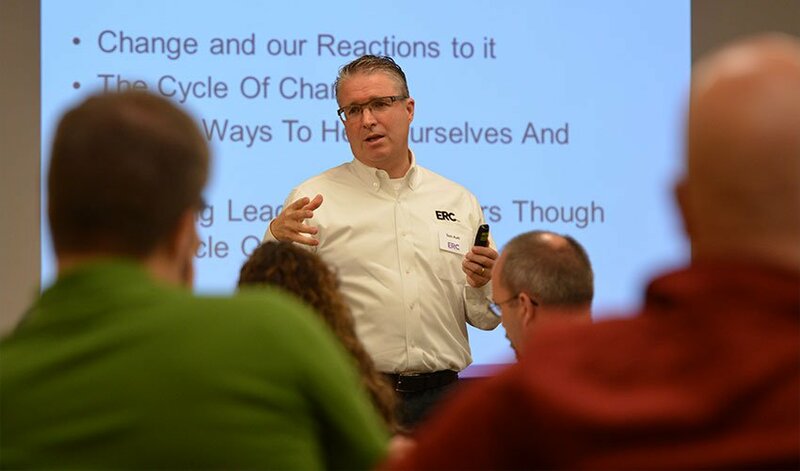 ERC provides Team Building training to help you build a purposeful team culture.